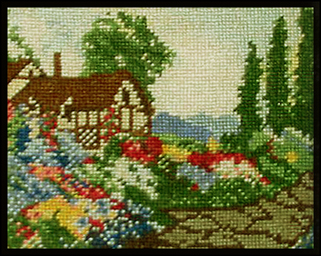 This design is based on an antique Victorian sampler. Stitched with Eterna Stranded Silk, available from www.threadexpress.com. This could be used either as a large cushion or a framed picture. It's designed from a photo of my kitten the day I brought her home for the first time. "Schatz" is a term of endearment in German, used as honey or dear would be used in English. Isn't she a little dear, and wouldn't she look cute in your dollhouse? This could be used either as a large cushion or as a framed picture. The annual Guild School is held in Castine, so this would have special meaning for those who have been there. These adorable little chicks could be made into a cushion or a wall hanging.